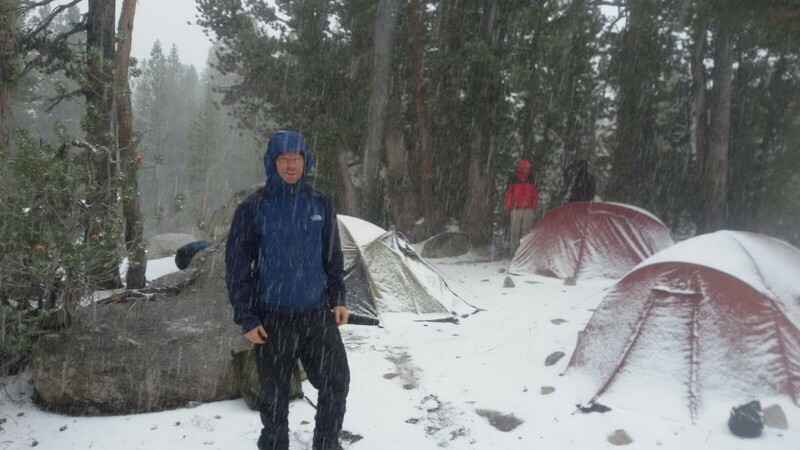 On the 6 September 2016 Northumbrian University Officer Training Corps undertook a level 3 Summer Mountaineering expedition to the Sierra Nevada Mountains in Yosemite National Park, California, USA. 23 Officer cadets, subalterns and army mountaineering instructors participated in the exercise, with 11 of the participants gaining the Summer Mountaineering Foundation (SMF) qualification and the remainder gaining 9 International Quality Mountain Days (QMDs), enhancing their experience and logbook toward their next military mountaineering course. 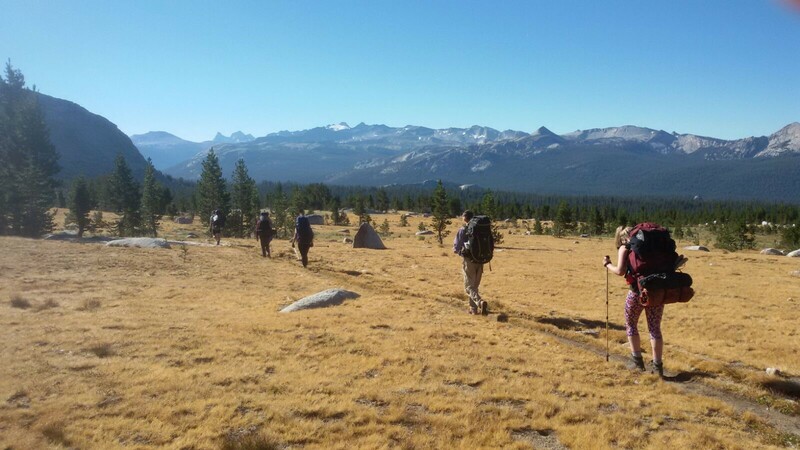 The exercise consisted of a 9-day trek through the wilderness of Yosemite National Park, with two preparation days (to stock up on food and resources) and then 1 ½ days’ R&R in San Francisco on the way home. The High Sierra Mountains is an outstanding venue for a trekking expedition and gave the officer cadets a great taste of one of the benefits of Service life – taking a dip in the pristine mountain streams at the end of each day was one of those ‘priceless’ luxuries that has to be earned and cannot be bought. The unit chose to conduct the trip in early-September, when the temperature was lower but before the Park closes in late-September. Even so, the temperatures were still high in lower valleys which made carrying bergans very arduous and so some of the groups decided to enjoy lengthened lunch breaks (and often a swim) along with regular water stops to guard against heat injuries. We enjoyed T-shirt and shorts weather for all but one day when two groups experienced some mild snow! All groups were prepared for much more challenging conditions. One of the factors involved in route selection was the availability of running water, and plans had to be confirmed or altered during the trek as the occasional walker told us whether streams shown on the map were still running or had become dry. As well as steritabs each group carried a water purifying pump and these were essential on several occasions. The remoteness of the routes added an extra dimension to the trip. Satphones were carried as an emergency precaution as normal mobile phones got no signal at all. Fortunately, we did not need to use these in anger as the secondary option would have been to seek help by running for 1-2 days to the nearest camp sites! Whilst it was good for the students to experience this sensation, it was a major factor for all of the group leaders’ dynamic risk assessment. The Park authorities enforce strict limits on the number of people heading into its backcountry. The groups had to travel and make camp separately so they were never in large combined groups of more than 9 and each had to carry the ‘wilderness pass’ that we’d bought from the Park’s website prior to the trip. Rangers patrol the routes and will occasionally ask to check these passes, with fines imposed if you’re found without it, we only encountered two rangers on the trails – both were very helpful and gave us excellent tips for our trip. There are also rules that prohibit camping close to a trail or water-source, camp fires are not allowed anywhere other than designated areas and no litter can be left, these are all designed to maintain the ecology and wilderness experience for the future. Members of the groups were lucky enough to see larger animals including bears, racoons, marmots and deer, we also saw lots of small mammals and insects along with quite a few snakes! Yosemite is home to a large population of Brown Bears, which (in general) are not aggressive to humans but food/wash kit/sun cream always has to be in ‘bear canisters’ that are stored away from the camp site at night. We rented the canisters from the Park but they did add an extra challenge to our already full bergans. 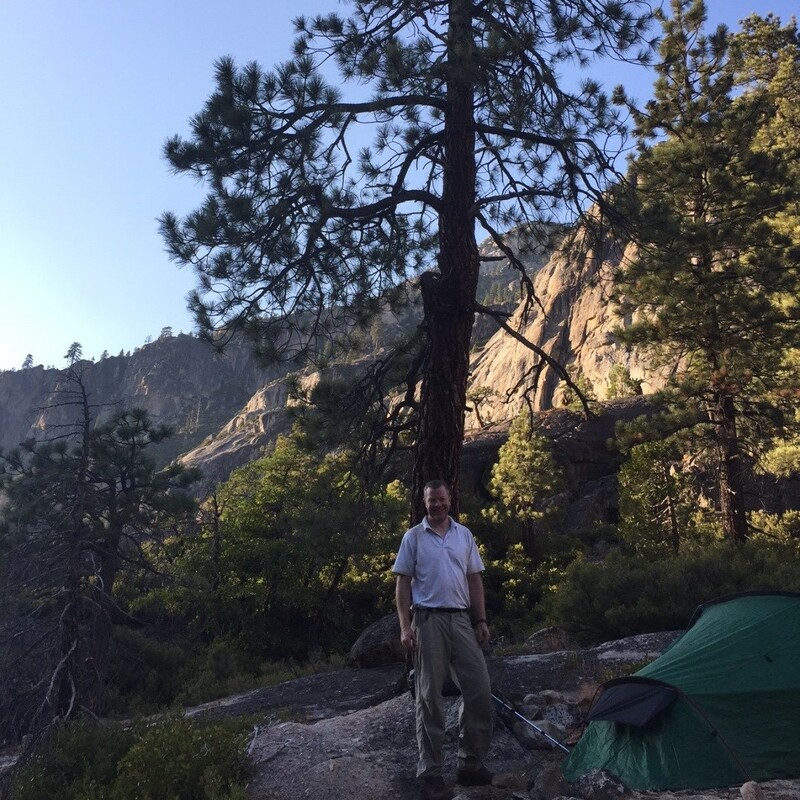 One group chose to not use tents and sleep under the stars in bivi bags every night! The groups chose different routes with similar drop off areas and the same pick up point, they covered 6-14 miles per day for 9 days including climbing to approximately 3,100m above sea level. Our routes began at White Wolf Camp-Ground and Hetch-Hetchy reservoir, went via Tuolumne Meadows (topping up our food/fuel), and ended at Little Yosemite Valley Camp-Ground (located beneath the epic sight of Half-Dome). None of the terrain was technical in any way or could be regarded as even Grade 1 Scrambling. Since the trip was at the end of the summer all of the rivers and streams were running low so there were no problems in crossing these other than perhaps a wet foot for the careless. The town of Yosemite Valley attracts the majority of tourists and a meal of burger and chips washed down with a sugary coke which was very welcome after several days in the wilderness. Everyone enjoyed an afternoon to relax and reconnect to the outside world on wifi, there was a chance to view the mighty El Capitan and then have a BBQ on our campsite that evening. R&R consisted of 1 ½ days in San Francisco; this is the best airport to use and there is a 5 hour journey from the city to the Park. Accommodation for R&R was in the Amsterdam Hostel – an ideal facility for our group with free ‘cook-your-own pancakes’ and unlimited coffee for breakfast, the officer cadets stayed in 4/6 man rooms each with an ensuite. There were certainly different priorities when it came to tourism some of the group went shopping and some did activities such as visiting The Golden Gate Bridge and visits to Alcatraz. Celebratory drinks in the hostel’s social area were the night time activity of choice for the elated but tired travellers at the end of this life changing and hugely developmental expedition.